Mortgage writedowns occurring, but how much? We often hear that banks are writing down mortgage debts, but then the lenders themselves say ‘this isn’t happening’. For such a large rumour there is a surprising lack of evidence on either side of the argument, although we do see scant documentation indicating this in some cases. If you click on the picture it will give you the larger version of the kind of documents we see from time to time. In this instance the client has said they owe over €200,000 but that they lender will take less than half of this, settling on a figure of c. €90,000 to clear in full or they’ll owe the difference if it goes for less. 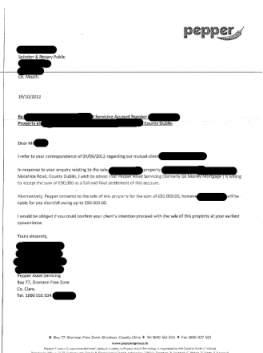 The property seems to be at a significant discount to others in the same area, and unless the person in question is not being honest (we have no reason to think they aren’t) then the letter indicates over a 50% writedown against the lender with no recourse being factored in. Who needs personal insolvency with a deal like that? Another recent example is an accountant who had a property in Longford who told us that the property next door to his was repossessed and sold, he found out that it sold for c €33,000. That’s a 5 bed semi-detached house that once sold easily for €220,000ish down about 85%. We checked the property price register and it seems it could well be correct. What we don’t know is who financed it or if there was a mortgage, but at those prices I’m suspecting somebody somewhere is getting a write down because the area mentioned was primarily full of owner occupiers and investors who would have a preference for using finance as they were all Section 23 designated and even if you could afford them having finance in place was a preferred route. So while we only see these stories via anecdotal evidence, there has been enough to date to suggest that writedowns are occurring on a case by case basis. More importantly, it demonstrates something that doesn’t get discussed – that to do this on a wide scale we would have had to shut down our banks. I can’t help but think (as a revisionist you never really know what the outcome could be) that had we just shut all of them and managed to save deposits that we’d be in a better place today. Who knows, the ‘known known’ now is that the writedowns do occur, but not fast enough or on large enough levels to make it a quantifiable segment of the market yet.